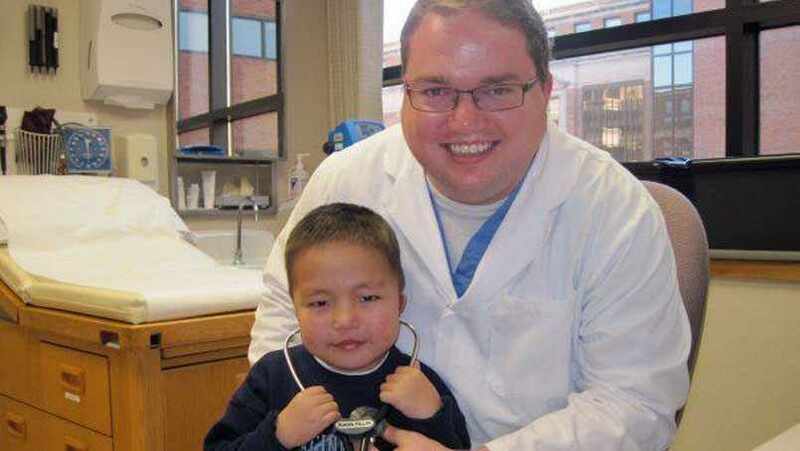 As a pediatric cardiology fellow at Mayo Clinic, Dr. Brandon Lane Phillips cared for a number of children from Mongolia who had congenital heart defects. Before they went into surgery, he would take a photo of their hands next to his on a white piece of paper. He would do the same again after surgery and before they returned home. The difference was striking. "In the pictures before heart surgery, you could clearly see a blue cast to their skin. After surgery, the blue was gone," he says. "That really hit home for me." It made an impact because Dr. Phillips is not only a physician who specializes in pediatric cardiology, he's also been a pediatric cardiology patient. "Many of the kids who came to us from Mongolia had the same heart defect I did: tetralogy of Fallot," he says. "They were often close to their teenage years and had never undergone surgery. These children were usually quite blue. They couldn't walk very far. It was a glimpse of what would have happened to me without the medical attention I received. "Being able to take care of those children was a unique and rewarding opportunity," he continues. "I'm glad to be able to offer that kind of care to my patients now." Soon after he was born, Brandon was diagnosed with tetralogy of Fallot. The rare condition is caused by a combination of four heart defects that affect the structure of the heart and cause oxygen-poor blood to flow from the heart to the rest of the body. If left untreated, children with tetralogy of Fallot usually have blue-tinged skin because their blood doesn't carry enough oxygen. In 1979, at age 2, Brandon had his first open-heart surgeryin Texas, where he received ongoing medical care as a child. From a very young age, he set his sights on helping other kids like him. "Growing up, I absolutely adored my pediatric cardiologist," he says. "From the time I could walk and talk, being a pediatric cardiologist was the only thing I ever wanted to do." In 2000, when he was 22, Brandon took a big step toward his goal when he started medical school at Tulane University in New Orleans. Before he began his studies, though, admission staff suggested Brandon meet with a pediatric cardiologist there to check his heart condition. Test results showed Brandon needed surgery to replace the pulmonary valve within his heart. The physician he was seeing recommended the procedure be done at Mayo Clinic in Rochester, Minnesota. Although Brandon had no way of knowing it at the time, that recommendation eventually would have a significant impact on the way he viewed the practice of medicine. Brandon had pulmonary valve surgery at Mayo Clinic the summer between his first and second year of medical school. As someone who had received regular medical care all his life, Brandon found his experience at Mayo Clinic to be unique. "The patient care was different than what I was used to in many ways. One of the things that impressed me most is that I met with a cardiologist and a surgeon in the same visit. Both of them sat down with my parents and me, and we all talked about what needed to be done," Brandon says. "The other thing that stuck with me was that I noticed in the literature Mayo Clinic said all the physicians were salaried. So it didn't matter if they were doing my surgery or not; they were going to get paid the same. That was comforting to me." Brandon's surgery went smoothly, and when he returned for a follow-up visit three years later, his appreciation for Mayo Clinic increased significantly. At that visit, not only did he see his physician for a checkup, he also secured a month-long assignment as a visiting medical student. "Seeing Mayo Clinic care as a student rather than a patient was absolutely eye-opening," he says. "It was amazing to see how efficient and patient-centered the clinic really is. Patients would come from all over and have all the appointments they needed with whatever specialists they needed to see. At other medical centers, that can sometimes take months. At Mayo Clinic, it often took just days." That month in Rochester left a lasting impression. When Brandon finished his medical residency and was looking for a fellowship to continue his training in pediatric cardiology, he applied to Mayo Clinic. He learned of his acceptance into the program on June 14, 2006: the five-year anniversary of his heart surgery. During the fellowship, which lasted from 2007 to 2010, Brandon worked with several physicians who cared for him when he was a patient. "To get to know them as colleagues was a wonderful experience," he says. "They gave me great care; you can't beat the care that's provided at Mayo Clinic. It was phenomenal to be able to learn from them, hone my skills, and pattern my practice of medicine off theirs." In addition to caring for children who came to Mayo Clinic from overseas, Brandon also journeyed to Mongolia on a medical mission trip during his fellowship. Traveling to meet patients where they live continues to be part of his practice now. Today, Brandon works in Corpus Christi, Texas, and much of his daily work includes outreach visits to far-flung communities throughout the state. "I travel to quite a few small towns and provide care to children and families who don't have the resources to come to a larger town for the care they need," he says. "I know that the way I work now, the way I provide care to these kids, was directly affected by my time at Mayo Clinic — both as a patient and as a student. The way they work and they teach is just amazing." Learn more about tetraology of Fallot. Explore pediatric cardiology at Mayo Clinic. Learn about the Mayo Clinic Children's Center.